Have you ever wished you could write your own ending to a story that maybe, didn’t quite, turn out the way you wanted it to? That’s sort of what happened with my newest novel, Resurrecting Harry. I’ve always been intrigued by the mystery and bigger than life persona that was Harry Houdini, and found the fact that Bess kept a candle burning for her dearly, departed husband for ten years a compelling – yet, very sad – story. I am a romance writer after all. The idea of someone dedicating the remainder of their life upholding their mate’s legacy rang of a Shakespearean tragedy. Some of the questions that ran through my mind were: Wouldn’t it have been better if she’d fallen in love again? But what of her star-crossed, fated love to her dear, sweet Harry? Harry could escape any confines. Or so he said. What if he had been able to escape death? Yes. It can get pretty scary in my head. 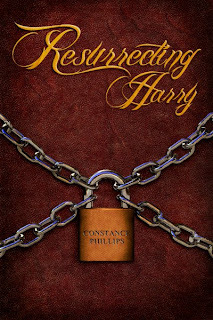 Resurrecting Harry is very different from any of my other work, but my process is much the same. I will hear a song on the radio, see a person waiting for a bus, or hear a bit of a news clip on TV. My mind takes that tidbit and goes off on tangents. It asks questions. Sometimes it answers those questions too. Most of the time, I find myself building, not only characters from the ground up, but scenarios, too. I create their fates. Did that one person waiting for a bus, just get dumped? Is he about to meet his soul mate? But Bess and Harry had their story. A beginning, middle and end already existed. I just wasn’t all that crazy about the ending. When the book opens, Harry is nearing the end of his time in Purgatory and meets its keeper. Harry ends up making a wager which allows him to escape death and return to earth with a new, younger face and body, a new name, and a mission to change Bess’s course. (just look for the pink Converse high tops).